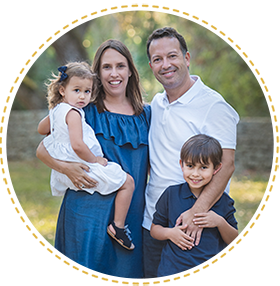 If you are concerned about giving your kids healthy food options, Homemade Healthy Gummies are the way to go. Real fruits, veggies and no refined sugars! You can also add supplements and make these little chewable snacks super nutritious. Make these little fun fruit and veggie snacks that your kids will absolutely love! Did you know store bought gummies or fruit snacks are full of sugar, high fructose corn syrup and artificial dyes? Check out the labels! The long list of ingredients indicates the snack is not a healthy choice. Dentists also blame fruit snacks to be the number one cause for cavities in children! They are really super easy to make, plus you will feel great about giving your kids a super healthy snack. Please check out also my Homemade Real Non-GMO Vitamin C Gummies or Blueberry Gelatin recipes for more fruit snack ideas and how to make your own vitamins at home. These little chewable snacks are made with real fruits and veggies, full of vitamins, minerals and essential nutrients! You don’t have to worry about high fructose corn syrup or dangerous artificial dyes anymore. Isn’t it great? Just whole fresh fruits and veggies. You can also get creative and add superfoods like chia seeds, ginger, probiotics, cod liver oil or kale to your blends. A good quality Gelatin is very important. This is why I recommend one made from 100% Pasture-Raised Beef. The collagen in this type of gelatin along with the many amino acids help regulate our metabolisms, have anti-inflammatory properties, strengthens hair and nails, and regulates hormones. Gelatin is also known to improve digestion. If you want to learn more about gelatin and its benefits, click HERE. You can also get a good grass-fed gelatin from Amazon. 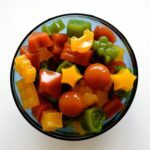 This recipe will make a big batch of healthy gummies snacks that you can keep refrigerated in a closed container for about a week or two approximately. The perfect healthy snack for kids. Real fruits, veggies, and lots and lots of nutrition. 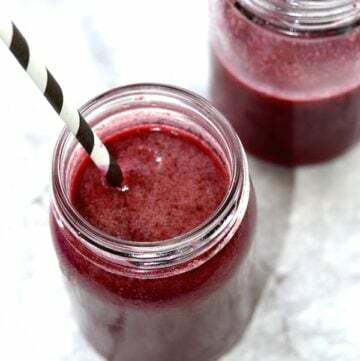 1 1/2 cups fruit and/or vegetable juice, freshly made with a Juicer (cold press -best choice) or store-bought (making sure it is 100% juice and preferably not from concentrate). Smoothie blends are great too! 4 tablespoons gelatin (I prefer a grass fed gelatin but you can find plain gelatin near the flavored Jello at your local grocery store. A tablespoons is usually one gelatin packet, but just to be sure, empty the packets into a bowl and use a measure spoon. 2–4 tablespoons Raw Honey depending on your preference and how sweet your juice is. You can also use maple syrup or stevia. If your juice has lots of veggies you will need more but it is up to your personal taste. Optional: Any other ingredients you would like to incorporate like probiotics or elderberry syrup (to prevent or fight a cold), or cod liver oil (immune system booster). Remember you can make these gummies your natural multivitamins. Then place the saucepan over medium heat on the stove. Let the liquid warm, but don’t let it boil. You want all of the gelatin to dissolve and turn thin and runny (it will be grainy at the beginning but after a couple of minutes in the heat it should dissolve completely).Add the honey, vanilla extract,and any other ingredients you will be using. *Update. 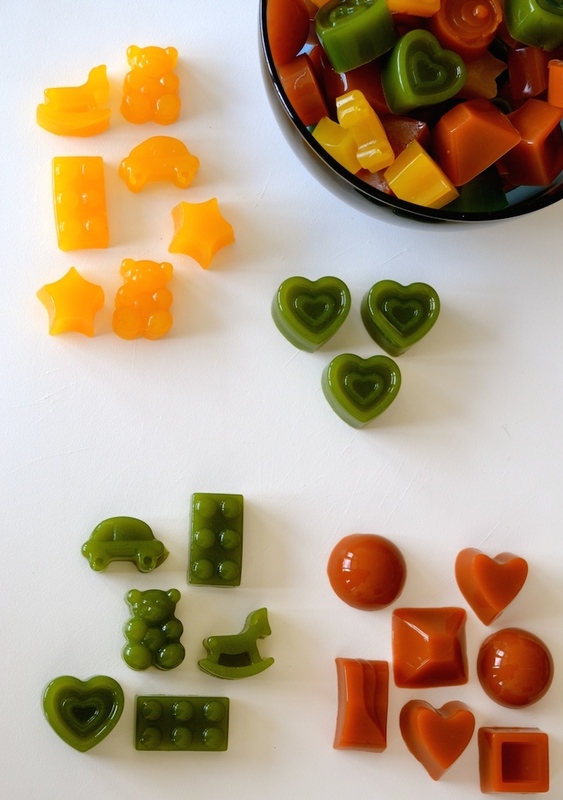 If you want to make smaller gummies, these are fantastic mini Gummy Bear Molds . They even come with a dropper for easy filling. Red: Beets, strawberries, raspberries, watermelon, red apples. Orange: Carrots, oranges, clementines, tangerines, mangoes, papaya, peaches. Yellow: Yellow pear, yellow apple, grapes (DO NOT use pineapple juice, your gelatin will not set up due to the enzyme bromelain that’s found in pineapple). Green:Kale, spinach, green grapes, cucumbers, celery, green apple (DO NOT use kiwi, your gelatin will not set up). Purple: Purple cabbage, blackberries, blueberries, concord grapes. If you want to change the colors and lighten up your homemade healthy gummies, you can also substitute some milk (dairy or non-dairy) for some of the juice in the recipe. I like using almond milk. A friend of mine recently tried my recipe and found the cutest Gummy Bear Molds . 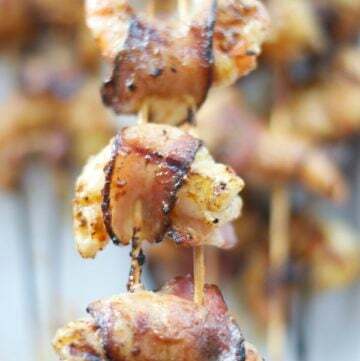 They are smaller than the ones I used for this recipe, but they come with a dropper, so you can easily fill them. They are made of 100% food grade silicone, non-stick, and are BPA free. I find them absolutely adorable. I need to get these ASAP! Hi Doris, I recommend silicone molds because they are very easy to handle but you can also use any type of baking dish or glass container (oiled). You can just cut the fruit snacks once they gel. Make sure you grease your molds or glass pan with cooking oil (or oil spray) to prevent sticking. I really haven’t tried using plastic. Hope this helps! Thanks for the quick reply. Made our first batch and they’re pretty good. Came out great in the glass pan and we cut little squares. Today we used a cranberry/apple juice mix. They tasted slightly citrus like, which was yummy, but I would prefer them to be more flavorful (not neccessarily sweeter.) Any suggestions on how to get more flavor into them? How could we make the fruit juice part of it more “potent”? Have you ever pureed frozen mixed berries and used them? I am glad you enjoyed the recipe! I haven’t tried to puree frozen berries yet but I don’t see why not if you want to try it. A friend of mine told me she made this recipe using apple sauce and the gummies came out great so I am thinking pureed fruit will be ok too. I think it will make the gummies more flavorful like you said because the fruit is more concentrated. I would blend it with a little water just like when making a smoothie. If you try it, please let me know how the gummies came out. Thank you! Hi Doris, I quickly looked at another homemade gummies recipe and found out you can use pureed fruit! For example, the recipe says to use ½ pureed blueberries (allow to thaw to room temp if using frozen) and 1/2 filtered water. I would do the same for other fruits: half and half and adjust the sweetness with honey. When you say use 1/2 puréed fruit and 1/2 water…do you mean half of the 1 1/2 cups of juice in the original recipe? So 3/4 cup puréed fruit and 3/4 cup of water? I was a little short on gelatin, but tried it anyway. They came our a little more firm than jello, but not really anything like a gummy fruit snack. If I added more gelatin would they be gummy, or is jello like normal? Hi Ashley, the texture is a little different (a little softer than store-bought gummies) but they should come out firm and not like jello. Hello all. Beware of ginger. It can digest the proteins in the gluten making the jellies, not jell. A little bit (half thumb) in a juice that also contained a whole lemon (pectin) worked out. The Red Peppers, Carrots, and three thumbs of ginger did not set at all. Even after another reheat and 4 more scoops of gelatin. Thank you Carla for the tip! In an effort to batch many things in my life, I was wondering if these freeze well at all? ANyone try or know? thank you for this, just what I was looking for, but was wondering before I make a ton, can these be frozen ? Hi, I haven’t tried it but I don’t think you can freeze them. is there anyway to extend the life? and not keep it refrigerated? Unfortunately I don’t know how to extend the life or keep them without refrigerating. I noticed that in one of your comments you mentioned spraying the molds. Do you spray your silicone ones too? I’ve made these before (slightly different ratio of gelatin to juice) and they didn’t stick but the batch I just made stuck horribly. It was a strawberry lemonade, a juice and brand I had not used before. I still have green, carrot and ginger lemonade juices to use. Is spraying necessary? I really don’t like buying cans of cooking spray. Hi, it depends on the molds. Some are great and don’t stick and some you need to use some oil. I don’t like using sprays either. What you can do is buy a plastic spray bottle and put your own oil in it. Hi Carrie, I don’t see why not. I would love to try them using maple syrup too! Please let me know how it goes. will do – could i add protein powder to these too? actually nevermind, i just noticed how much protein is in gelatin -doesn’t need protein powder! What probiotic brand/type do you recommend for these gummies? Any other specific additives that you have had success with? Thanks! Hi Amanda, I buy Garden Of Life RAW organic probiotics. They have them available for kids and adults. In my opinion, the best probiotics in the market. As far as other additives, I like to use a little grated ginger or turmeric. 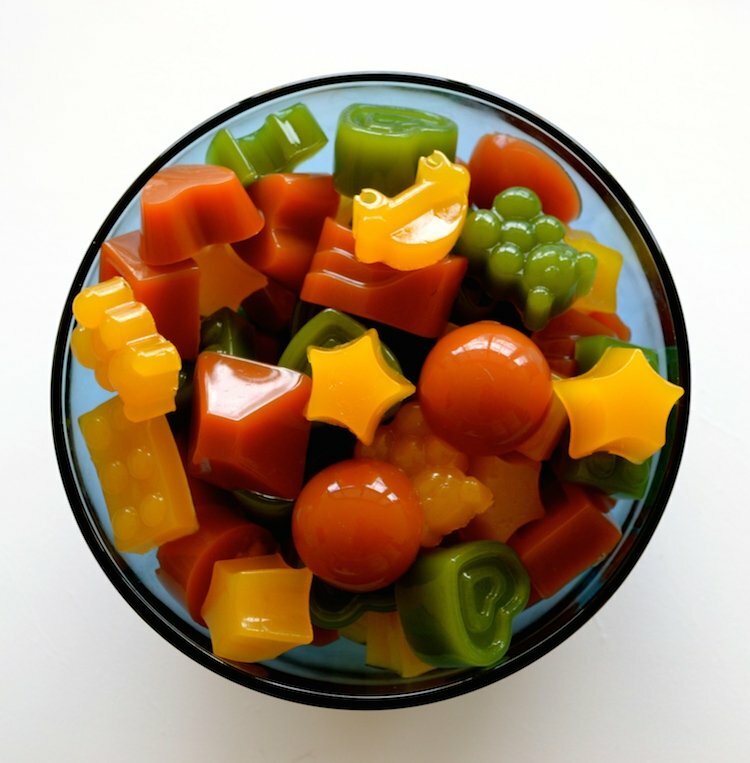 Just blend it with the fruits or veggies to make your gummies. Thanks much! Got some molds so I’m going to give it a whirl today! What is the shelf life on these? Are they good for a month? Hi Markel, I usually keep them in the refrigerator for a week or week and a half. I love your recipies! Just made gummibears, and they turned out great! I used cold pressed beet and apple pure juice, ricemalt syrup and vanilla extract and of course the gelatin powder. So good and soo cute! Thank you! Im planning on trying lots more recipies. Thank you Anne. Homemade gummies are so delicious! Just fyi. I’ve made this with kiwi’s many times. It works quite well! Just throw a little bit of lemon juice in there. Its really good. Thank you! I am going to try the kiwi/lemon juice combination soon. I ❤️ ???? But any idea on what makes the original candy ‘chewy’? Hi Steph, Thank you for your message. I am glad you enjoyed my recipe. What you can do is play around a little with the gelatin amount. Try using a little more for more “chewy” textures. I guess the original candy gummies have a lot more ingredients and preservatives. Maybe that is why they can achieve the chewy texture. Thanks! I’ll try that with next batch. I did not use honey with the first batch because I used organic pear juice, and I thought it might be sweet enough. I think I’m definitely going to use the honey next time. And I wonder if it’s the corn syrup that makes the “gummy” texture. I guess it’s one of those give-and-take things when you want to try to do healthier. Worth it tho! I tried this recipe. It was bit hard to get the gummies out of the silicon moulds, they teared here and there. And at room temperature they become just like jello. Not like gummies. I dont know what went wrong. Hi, so sorry the recipe didn’t come out good. These gummies need to be refrigerated or they will melt. Also not all the silicone molds are the same. Try putting a little oil (I use coconut oil) before to prevent sticking. Hope this helps! Hi.Thank you so much for all your effort to share your wonderful recepies with us! (Great Lakes Gelatin Co., Collagen Hydrolysate, Collagen Joint Care, Beef) Should i use some different gelatin ?? Hi, thank you for your message. I have used the green gelatin you are describing without any problems. thinking it could be that. You should not have this problem if using the right amounts. Hope this helps. Hi Ursula.thank u for your reply. Im not gonna give up they just look too good for my todler!I made it one more time Ill let you know later if its turned out. I notesed you said its needs to be dissolved on the heat. Mine dissolves right the way i can’t even see the wrinkles “/. Hi Tamara. Oh no! It’s not supposed to be that way!! This is why it is not coming out the right way I think. What you can do is buy plain gelatin at the supermarket and try to make the gummies with it. It is not really the best type of gelatin but so you can see the difference. Then I would recommend getting one of the gelatins I link in the recipe. A good grass-fed gelatin is really the best! Maybe the green one is an instant gelatin. In that case it won’t work for gummies but you could use it for smoothies to get some extra collagen 😉 hope this helps. Let me know when you make the gummies again. I am sure you are going to love them!!! What is grass-fed gelatin? I’ve never heard of gelatin that consumes grass before. Hi, grass-fed gelatin comes from pastured raised cows. The best kind ???? Mmm yummy !! I’d definitely try this ! This looks so delicious! I can’t wait to try this out. I am very interested in trying this out. I am a lover of gummie bears and also someone who has a hard time getting their recommended vegetable servings into their diet. I am in the market for a cold press juicer and intend on making juices. I thought this would also be a great idea for a snack plan. I was curious if you knew how long the nutrients last in the gummie form? I know the rule of thumb with juices is about 3 days after the juice is created. Do you believe this would hold true for the juice in gummie form? Also, what is the life expectancy of the gummies once made? Any information would be much appreciated thank you for the amazing idea!!! Hi, a cold press juicer is the best to preserve all the nutrients. It is always better to drink the juices right away! I make these gummies for my kids and add supplements all the time. It really works because they enjoy them as a snack and I can include some important supplements like probiotics, chia seeds, coconut oil, and other things in my blends. Hope this helps! Hi, I don’t think you can freeze gelatin. Sorry! I just mixed this up but I had trouble getting 4 T of gelatin. I used Knox and each envelope was noticeably less than 1 T. I ended up doing 5 envelopes (4 were in the box and I happened to have a spare) and still didn’t quite get 4 T. Is that normal? 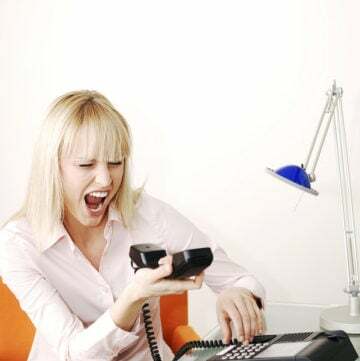 Hi, as long as you use 4 Tbspns you will be fine. I don’t use Knox so I can’t tell you. I highly recommend a good grass-fed gelatin. You can buy it online. Hope this helps! Let me know if your gummies came out good! They turned out quite firm. I’d probably just use 4 envelopes next time so I wouldn’t have to buy two boxes. I won’t be buying grass fed gelatin online. I want my DIY to be home easy to do regularly and not require a lot of money or forethought. Hi, I really don’t know anything about clear jel. Sorry! Hi I will love to use agar agar but I tried many times and it is no working and I don’t know why whould you help me please. Hi, I’m sorry it is not working out with agar agar. I only use gelatin. Is it safe to say these need to remain refrigerated? I want to make them for my son’s 2nd birthday party, good knows tiny humans don’t need the sugar and junk in candy. So I wanted to out the gummies in the pinata. Hi, Yes. They need to remain refrigerated. When out, they will probably last about 1 hour aprox. Great idea for your party. Let me know how everyone liked them! I’m wanting to add fish oil, echinacea liquid & probiotic to my gummies. Can you please advise me as to how much of each I should add? Great idea! I will try at home! Thank you. Hope you like the recipe! Hello! Not trying to be petty, as I would imagine maybe someone else added to your original post??? Or this post was confused with another recipe??? Either way, just wanted to let you know under ingredients on the initial Pinterest page it states “vegan.” Obviously these are not vegan due to the gelatin, and that is what I’m looking for my vegetarian/near vegan 11 year old daughter who treats gelatin like poison! If you have any vegan sub for gelatin I’d love to hear about it! Oh no! It might have been a confusion but know that there is a substitute for gelatin. It is called agar-agar. I’ve heard it works well for this recipe. Hope this helps! This is a great basic recipe, thank you! I’ve tried a lot of gummmies recipes with varying ratios of juice to gelatin. This one is the best! My favorite way to make these is using half unsweetened applesauce and half fruit juice or water, pureed together for the juice part. It gives a really nice soft bite, not rubbery or weird. My favorite combo so far – and I make these weekly! – is 3/4 c. applesauce with 3/4 c. 100% cranberry juice, 4T honey, and 1/2 tsp. vanilla. Plain applesauce and water is good too. Hi Megan, I am so happy to know you love the recipe. Hey there, I tried the recipe and added omega oils to it, but the oil separated from the gelatin mixture set. The gummies taste good but turned out slimy. Any ideas how to get the oil to mix better? I just tried these tonight! I haven’t even given them the full set time to see how they’ve turned out, but had a question. You mention adding probiotics, but how are they not completely killed by the heat? I assume you’d have to add just after the gelatin has dissolved, but most probiotics can’t survive much heat. How do you prevent this? Hi, thank you for your comment. Yes, add the probiotics afterwards to preserve them. Hope you like the gummies!